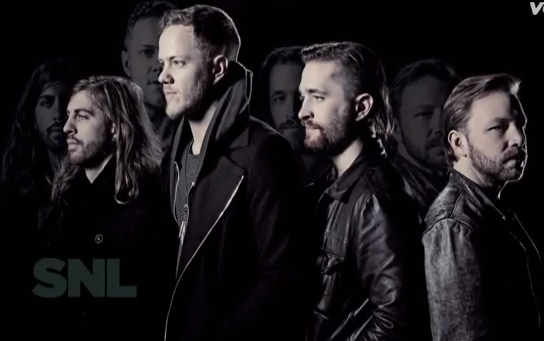 Imagine Dragons: “Radioactive” on SNL – Nerdwatch! By Captain Nerd | February 8, 2014 - 12:35 pm | February 8, 2014 artistic things!, cool things!, musical things!, neat things! I haven’t watch Saturday Night Live in many years, but recently I found a song called “Radioactive” by a group named “Imagine Dragons”, and stumbling around YouTube I found that they performed the song with a rapper named Kendrick Lamar on SNL just a few days ago. This is a powerful song, and the live rendition they gave on SNL is one of the most energetic of performances I’ve seen of any band. I don’t really like rap, but Lamar’s soliloquy definitely boosted the energy of the rest of the performers, and the audience was fully engaged, as you can tell by the applause at the end. I’ll have to listen to more of their music, to get a feel for what else they’ve done, and I also want to find the lyrics, but at least this is a good song to get the heart racing and adrenalin pumping. Tagged Imagine Dragons, Radioactive, rap, SNL. Bookmark the permalink.